The March 5th weekend will mark a first for the S Scale Workshop. 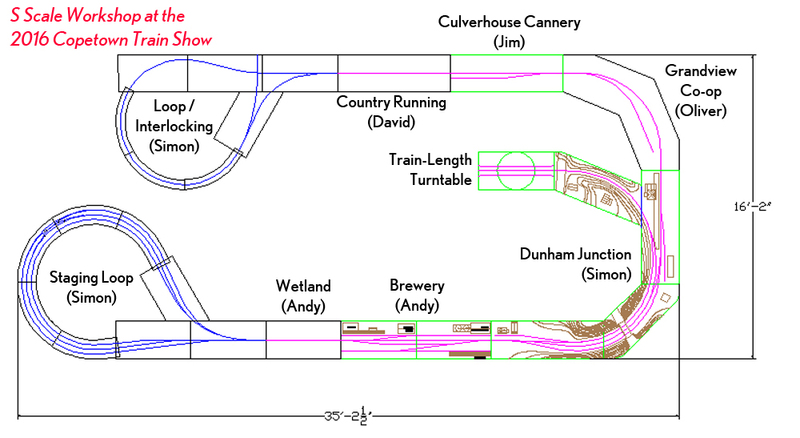 For the first time in our 20-year history we will be have operating S scale layouts in two far flung venues. Our principal display will be at our annual favourite, the Copetown Train Show. This is a small show held in Copetown, Ontario - just west of Hamilton. The show may be small, but it attracts high profile modellers and manufacturers from across the country. It’s more often thought of as a think tank rather than a train show. Saturday is a low pressure setup day with lots of conversation, networking, and catching up with far flung friends. Sunday, when we open the doors to the public, we all pretty much behave ourselves. Simon Parent, Andy Malette, David Clubine and Jim Martin will host a large modular layout showcasing our 1:64, Canadian National Railways theme. They'll be helped by Brian Nicholson, Trevor Marshall and Fredrick Adlhock. There is also a chance that our old friend Claude Demers will travel from New Jersey to join us. 200 kilometres to the east, Workshop members John Johnston and Paul Raham will have their S scale modules set up at the Cobourg Train Show. (Check the CARM Events page for details.) John’s excellent Burnt River module will be flanked by Paul’s Marshall Station (Featured in the May/June 2015 issue of The Dispatch - the magazine of the NASG). 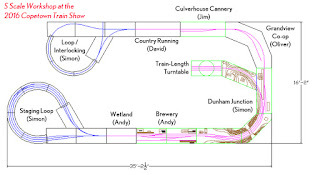 The layout will also include of of our two four-foot long train turntables. Paul’s module is an engine terminal with a turntable. The point-to-point running does a fine job of engaging the viewers’ interest, as proven at last year’s show. The Cobourg show is Saturday only so we are hoping Paul and John will have enough energy to join us for the Sunday show at Copetown. We didn’t plan to do two shows the same weekend, but John organizes the Cobourg show and was obviously locked in when the Copetown show moved from February to March. Nevertheless it demonstrates the versatility of our Free-mo format. This is also a special weekend for the group: our 10th and 20th anniversaries. In March 1996 we first displayed as the Southern Ontario S Scale Workshop in Brantford, Ontario. We shuffled trains back and forth on the four unfinished front sections of our first layout, the Ridgehill Central. 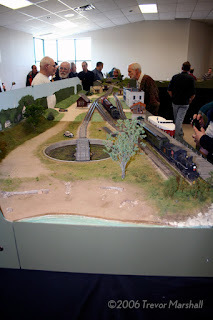 In March 2006 at Copetown, we first displayed our new Free-mo modules as the S Scale Workshop. We made enough of an impression on Trevor that he wrote nice things about us in the June, 2006 issue of Railroad Model Craftsman magazine*. We expect other S scalers from southern Ontario to drop by and we will be raising our glasses later to our late founder Oliver Clubine and another fine S scale modeller who passed only days ago, Tom Spaulding. We hope to see you there. Or there. I won’t bore you with the details, but health issues the past year took precedent over the basement, so little had happened since my last entry on making grass from wig hair. Now that my mojo’s back, I took advantage of an unusually quiet Christmas holiday period to get back at it. There is still much scenery work left to do on the Port Dover side of the layout, but in the meantime I have grown tired of looking at the flat, trackless sections across the aisle. A closeup of the turntable area at the start of the year. The same area, one month later. There is nothing ground breaking here. Everything you see here is a technique that someone else has done first, including the mirror trick by the late John Allen. I am trying out some new (for me) scenery techniques from the Gordon Gravett books (see Trevor's blog entries on Gordon's work for details), including the use of fireplace ash sprinkled on to gloss gray enamel for road surfaces. I’m pleased with the initial result but will be weathering it with something. I will also be filching some static grass techniques from his book, but before that, I’ll be reaching across the layout to paint the backdrop. There is also track work to complete. I have yet to draw a finished plan of what the entire layout will look like. It’s certainly easier to know the context of what someone is doing if you know where it’s being done. That said, I have a friend in New Jersey who has offered to do up a proper job for me so once he gets back from Florida we’ll get going on it. I can tell you that what you see here is a loose representation of the south end of Simcoe, where the tracks split for Port Rowan and Port Dover.